Snrky: It’s not lost hope and shattered dreams? It’s not lost hope and shattered dreams? I have seen what lies beneath the edges of cube walls. The dust and dirt and skin and paper and ink and nastiness of everyone who has sat there or walked past since the last changes to developer layout intended to ensure optimal efficiency. There was a time when rows and columns of desks were considered the best environment to type. Cubes were introduced as a way to put humanity back into the system and offer workers their own space. Since then, they've come to be associated with large enterprise office work (although smaller companies can be equally cubicular) and the drudge that can go with working in a place that can be dehumanizing by sheer size. And then we went open space. Which in some respects can look suspiciously like those first secretarial pool layouts. And then we try to strike a middle ground. Open space, bordered by enough walls to make a team feel separate. That one is still up in the air, although I like it, having worked in a similar environment when I was first a contractor. The only downside was a coworker in my bounded space flipping a bowl of fried rice into my floppy drive. Fortunately, floppies are yesterday's news and you get to spend half a day relaxing if your computer is full of rice and a bit of sweet and sour sauce. Title: It’s not lost hope and shattered dreams? 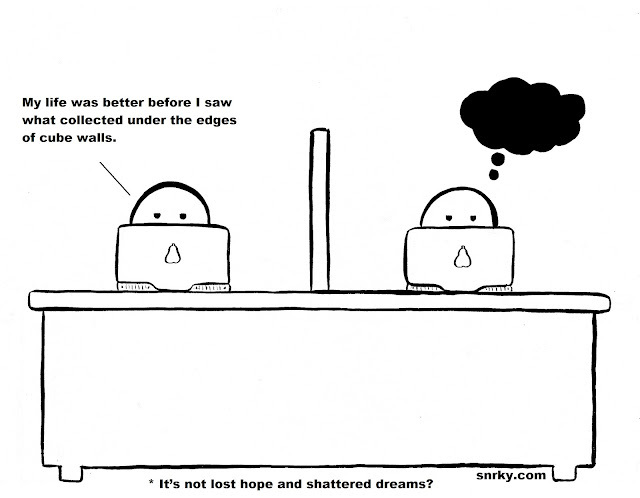 Snarky: My life was better before I saw what collected under the edges of cube walls.